What are intaglios and cameos? 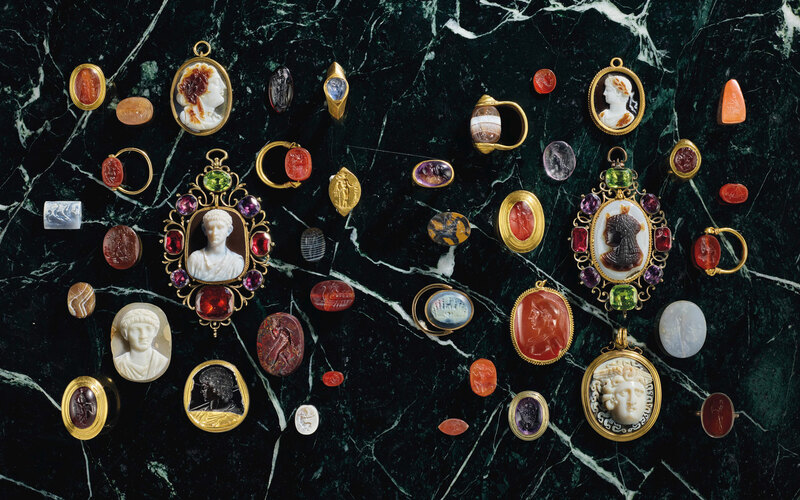 Ancient engraved gems, which were historically worn mounted on finger rings, fall into one of two categories — intaglios, which have designs cut as a depression into the surface of the gem; and cameos, which have excess material removed to leave a raised image in relief. ‘Despite their small size, the highest quality engraved gems rival monumental marbles, vases and bronzes in terms of artistic skill,’ explains Christie’s International Head of Antiquities G. Max Bernheimer. These were highly prized items and were normally made from precious and semi-precious stones, such as carnelian, agate, jasper, chalcedony, rocky crystal, amethyst, garnet and sapphire. ‘Their material, size and colour would reflect the wealth and taste of the patron,’ adds the specialist. The gems were usually set in gold, silver or bronze mounts, sometimes on plain bands, or occasionally with more intricate designs. While many have lost their original mounts, some can still be found in their ancient settings. The earliest engraved gems were cut by hand with simple iron tools, including pointed drills and cutting wheels, used in combination with fine abrasive emery powders. The diamond-tipped drill was introduced in the 5th century BC but did not become common until centuries later. Some gems contain a small hole drilled through the centre which allowed for it to be mounted on a swivel-setting, so that they could be worn with the engraved side against the finger. They could then be removed and the stone rotated for display and use. When and where were they made? The tradition began in ancient Mesopotamia, some 5,000 years ago, when stamp seals and cylinder seals were pressed and rolled into damp clay. From there it gradually spread throughout Minoan and Mycenaean Greece, Persia and Egypt. Around the 16th century BC the Minoans began making small rectangular stamp seals. The tradition was lost towards the end of the Bronze Age, but revived in the 6th century BC with small, oval-shaped intaglios usually in the form of a scarab beetle with the underside engraved. During the 5th century BC the detail on engraved gems became finer, and by the 3rd century BC the conquests of Alexander the Great allowed the flow of new exotic stones around the Hellenistic world. The Romans continued the Hellenistic tradition for intaglios and cameos. ‘The Roman writer Cicero once noted how people wore portraits of their favourite philosophers on their rings,’ says Bernheimer. The Romans also began making glass from which cameos could be cut, allowing for consistent and predictable layers of colour. ‘The best known example of this tradition is the Portland Vase in the British Museum, which went on to inspire Josiah Wedgwood’s monochromatic ceramics,’ adds the specialist. What kind of motifs were engraved on them? Mythological figures, animal studies and portraits were popular subjects in all periods of engraved gem production. Some examples also have inscriptions identifying their owners (written in reverse so as to be correctly seen when impressed). Occasionally, the name of the artist who engraved the gem is also included. ‘The carver Dioskourides is known from ancient literature as the court engraver to the Roman emperor Augustus, and his signature survives on the amethyst intaglio above,’ says Bernheimer. Some Roman intaglios and cameos were often larger in size, and were perhaps worn around the neck rather than on the finger. These allowed for more detailed images to be created, such as the above depiction of the Roman emperor Claudius. While many engraved gems have been discovered in archaeological excavations, most are chance finds. Bernheimer cites the example of the draining of the Roman baths in Caesarea in Israel, which resulted in numerous gems being found, some of which may have slipped from the fingers of bathers. Ancient writers also describe large deposits of engraved gems being offered to the gods in Greek and Roman temples. Other engraved gems have survived above ground. In the Middle Ages they were prized by royal collectors and often set into ecclesiastical objects such as book covers and chalices. After the Renaissance a renewed interest in antiquity inspired a new breed of collector. ‘In the 17th and 18th centuries Grand Tourists displayed cases of engraved gems in their stately homes as souvenirs of their travels,’ says the specialist. The 4th Duke of Marlborough, George Spencer, amassed a collection of 780 gems during the 18th century, and commissioned Joshua Reynolds to paint him holding his prized cameo of the Roman emperor Augustus. His collection was sold by Christie’s in 1899, and many of the gems are now considered lost, known only through surviving casts and impressions housed in the Ashmolean Museum in Oxford. The cameo shown below, which depicts a Julio-Claudian prince, possibly Germanicus, wearing his toga and wreath, was once in the Marlborough collection. The trend for collecting, as well as wearing, ancient gems has remained popular throughout the past few centuries, and as a result many examples that come to market have been remounted in modern settings. What is the appeal to modern collectors? ‘These ancient engraved gems offer a fascinating scholarly window on the ancient world in terms of life, fashion and ritual, while also proving that the tradition for sentimental jewellery is thousands of years old,’ says Bernheimer.